This is the first of three segments concerning 6” ADVERTISING pieces, or those with lettering on the face or top side. Small bowls, flat plates, single handgrip, and double handgrip (card tray) shapes comprise this grouping of Glass, and they are found in amethyst/lavender shades. The best way to describe these specialty items, we believe, is to define them in today's language. Owners of business interests from time to time feel that premiums will boost sales of products. We all know what “coupons” do for inducing sale of grocery items. Such was the case with giving these Glass products away as promotional bonuses for having purchased chocolates, furniture, real estate, etc. There is no clue as to what sort of business the name Ballard represents. John Resnik states that months of research were required to discover a telephone listing for one Simeon M. Ballard Insurance and Real Estate, located in Fresno, Cal. Seemed there were branch offices established in several small towns around Fresno; Merced being one of them. Further research revealed that the Merced branch manager decided to promote his own kingdom of interest, ordering this item with no mention of his decision to the parent organization. Back pattern on this design is Basketweave and the manufacturer was Northwood. 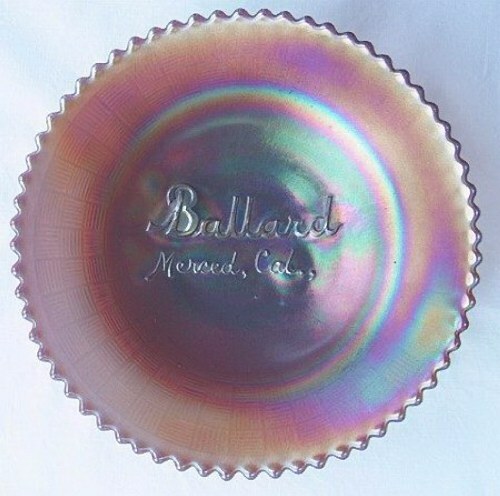 A Ballard plate sold for $800 in April 2001, that being the only recorded example in auction listings for the year. In 2003, a single bowl sold for $735. Although Mr. Resnik states in his 1989 publication that ruffled bowls are “available”, with no H/G style verified, the overall availability of the pattern can be termed “scarce as hens teeth” by today's standards. At the time of John's writing, only 4 flat plates were known. Whether that status has changed, is not known. Certainly, IF there are additional pieces, they have remained in collections over a long period of time, or changed hands privately. Our plate example was purchased in 1987 from a couple who no longer are active in Carnival Glass: Chuck and Peggy Bullard of No. CA while we were all attending a convention in St. Louis. It is worth noting that this design, along with the Broeker's Flour design, are the only two known Advertising patterns having no other than the script displayed on the front surface of the pieces. The Mums plunger was not used for these. A flat plate sold for $1300 when the Adams' collection was sold in Nov. '03 in Wentzville, MO. 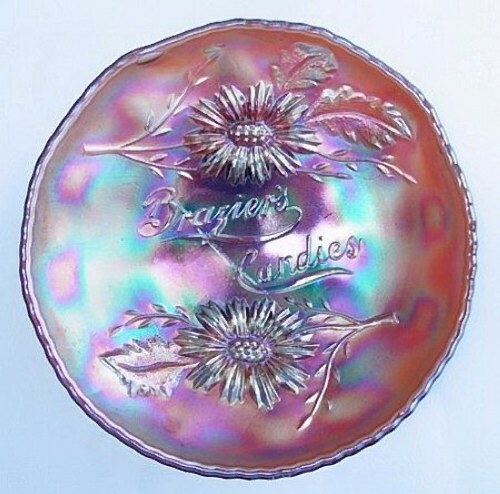 Sold with regularity in Carnival Glass auctions and over Ebay, this 5 ½” ruffled bowl is the only shape known in the pattern and is always in amethyst base glass. One example is known to have Benesch spelled “Benech.” Should it surface, one might expect to pay about double the going rate for those having correct spelling. In any given year four or five of these bowls will pass through the various large Carnival Glass auctions, with prices ranging from about $300-$550, give or take a few dollars in either direction. Annapolis, Md. - 123-127 Main St.
Baltimore, Md. - 549-557 & 567-571 Gay St.
Pottsville, Pa. - 122& 324-326 S. Centre St. The above cities are listed on the face of this piece as locations for their places of business. The Great House of Isaac Benesch and Sons was the largest home furnishings department store of its time. The Company was established in 1858 and eventually grew to encompass 13 retail outlets and 16 warehouses. 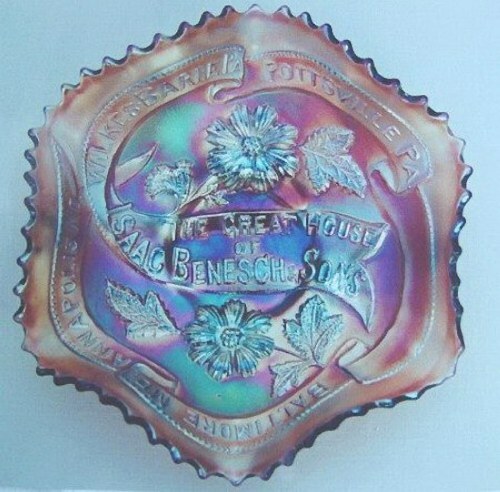 Isaac Benesch died in 1907, passing the family business along to the Sons of the title; Aaron, Jesse, Samuel, and William. Although there is a many-rayed star on the base, such as Millersburg pieces carry, this has been accepted as an anomaly. The edge, and everything else about this piece indicates Fenton to have been the maker. At least Fenton has become the accepted origin of manufacture over the years. It has the Wide Panel exterior. One additional point of note: This bowl displays an entirely DIFFERENT basic mold design from those used on OTHER Fenton Advertising, and is unlike those found on the Millersburg and Northwood Advertising pieces! This is another of the lettered pieces from Fenton. When John Resnik researched and compiled data for his Encyclopedia of Carnival Glass Lettered Pieces in 1989, he could find no attribution for this design. No information about the company came to grasp. The National Confectioners Assoc. took an educated guess that this company probably was from the Western Great Lakes Region, which was a purported hotbed of candy manufacturing in the early 1900's. Since the NCA maintains no historical records of any kind, that was the best they could offer. On 10/6/97 our friend Bob Williams phoned from South Dakota, to say that he had discovered on a business trip , that indeed the Brazier's Candies was located in Helena, Montana. Knowing of our interest in the Advertising pieces, he felt we should know that. Thanks to his kind efforts, another bit of history has surfaced! Ruffled and ice cream shape bowls are very scarce, as are the handgrips. Plates are rare. A handgrip style sold at $900., along with a flat plate at $1100, from the Adams' collection on 11/22/03 in Wentzville, MO. Our flat plate was $1050. when purchased from Bart Dooley in Jan. of 2001. Location for this business failed to be on record in the Minnesota State Library, although that State seemed a logical origin for such a thriving manufacturing concern. John Resnik inserted an update just prior to going to print with his Encyclopedia on the subject, saying he had accessed the National Demographics Study, revealing four locations as the most likely sites for this company. Upon delving more deeply into the subject, no definitive data was forthcoming from MN, NE, IA, or KS. 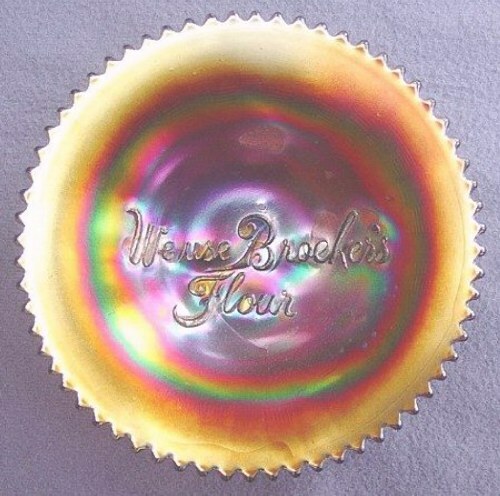 The official label of the millers responsible for providing the We Use Broeker's Flour Advertising plate is shown above. While researching the ancestry of her husband's family, *Rita Broeker, O'Fallon, MO. discovered our site, indicating a link to her needs. She contacted the Public Library System for assistance, discovering that while Charles Broeker was not a part of her husband's past; she realized that our need for locating this latent information could be satisfied. *Her kindness in contacting us, offering to provide copies of her paperwork for verification is sincerely appreciated. Born in St. Louis in 1858, Mr. Broeker moved with his parents to Springfield, StateIL, where at age 15, he held his first job as a worker in his father's flour mill. In young manhood, he moved to Greenville, IL where he became engaged in the flour milling business for a short time. Moving to Owensboro, KY in 1893, he organized the Chas. Broeker & Co. milling company which had 14 fulltime employees. Subsequently, his nephew, L. E. Spring became associated with him in the business and eventually was made manager by Mr. Broeker. The products: meal, grits, hominy and other corn products were in great demand for the home trade in the southern states. In addition to the sales made in this country, a large amount of the hominy feed was exported to Germany. Several railcars left the mill each day. Remaining a substantial Owensboro business man for 40 years, Charles Broeker lived to be 74 years of age. His milling company was located at 108 Crittenden, Owensboro, KY.
TIME FRAME: Production of lettered pieces in general, and advertising pieces in particular, was relatively short-lived. Most of these items were made between 1910 and 1915. Advertising mediums change with time, and perhaps the glass manufacturers had expanded their businesses to a point of not having further need of small specialized orders. The maker is Northwood, and the back pattern is Basketweave. Ten or twelve flat plate examples were known at the 1989 writing. We purchased ours in July of 1987 when Chuck & Peggy Bullard of No. CA were selling off some of their collection. A very good illustration of the scarcity is indicated in the two auction sale prices listed for 2001. One having worn iridescence brought $900. The other sold for $1000. Circumstances indicate that should an example be passed upon, perhaps YEARS ensue before another presents itself for inspection! A nice example sold for $1750. in 11/03, when the Jack & Mary Adams collection was sold in Wentzville, MO by Seeck Auctions. Known only in the handgrip style plate, the bent portion can be found at virtually every level around the plate. The randomly shaped edge is scalloped. A many rayed star such as the one found in the marie (collar base) of Two-Eyed Elk pieces. These two characteristics are known to be of Millersburg origin. Derivation of the store or business place is unknown. These are very scarce pieces and usually have nice bright, satin-like finish with pleasing color. Our lovely example was purchased from Chuck and Peggy Bullard of Northern California in August of 1987. The Bullards later sold their collection during an ACGA Convention auction. In Sept. 2002, an example in this pattern sold for $800. The who, what, where, and when aspects of these Advertising pieces proved to be an “invigorating challenge” for Mr. Resnik. He should be pleased with the outcome of his efforts in the years since 1989. Prior to those efforts, little or no interest had been displayed by collectors for these highly specialized items! Only in broadest terms was historic fact available, surrounding the circumstances under which many of these lettered pieces had come into being. However, in the case of this Shoe Store, the exact date of its debut was discovered. The Central Shoe Store opened its doors for business on Saturday, November 21, 1908. Announcement of the opening was stated on the prior day, in the East St. Louis Journal, stating that souvenirs would be given to all who attended the opening! Apparently business was not good for Messrs. C.W. and J.H. Byerly of Quincy, Illinois. Their business listing was discontinued after 1911. This design was manufactured by Fenton with the Wide Panel exterior. It can be found in ruffled and ice cream shaped bowls, as well as handgrip and flat plates. All should be considered quite scarce. Few of these ever reach public auction. Our little gem was secured in November 1983 when we visited Christ and Ethel Harnish over in Pennsylvania. This was when they still lived in the big house with all that wonderful and exciting china collection. Once we had drooled long enough over that, we were taken upstairs to see Carnival Glass! Now, Christ had what he called the “no-No”! cabinet with articles of choice treasure which were not for sale-only for display…….Would you believe that we convinced him to part with this plate?......However, he and Ethel held a private “conference” to decide upon an appropriate parting price. We decided that we could meet their challenge, and have thoroughly enjoyed having the plate in our growing collection. By today's standards for this piece, we very likely owe them money! During the auction year 2002, a couple of bowls sold for $950 and $850. A handgrip plate brought $1100. A flat plate went for $2500. A plate included in the Adams collection sold for $1300 on 11/22/03. Although Mr. Resnik lists a flat plate in this pattern, we have never seen one in our years of search. Should one exist, it could be termed Extremely Rare! Handgrips seem to be pretty scarce. No bowls are known. One handgrip only, sold at auction during 2002, bringing $800. No indication offered as to any problem with the piece, but the price seems somewhat low. A nice handgrip example was sold from the Adams' collection in Nov. '03 at the price of $1000. John's educated guess about placement of this business was somewhere in Northern Missouri-Southern Iowa locale. His efforts to substantiate this was repeatedly thwarted. Perhaps some of you have knowledge of its whereabouts? 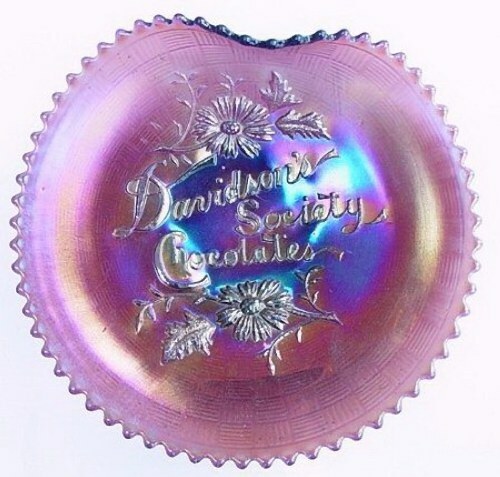 There is no date on the piece to offer any clue whatsoever, but we must assume that since chocolate companies were “springing” up during the early 1900's, Davidson's too, made their debut during that time frame…..And would it not be NICE to be given a pretty Carnival plate even today, if we were to step into a See's, or a Russell Stover outlet for a $10-$20 box of chocolates?.......Dream ON! This was a Northwood endeavor, replete with their Basketweave exterior. Note the smaller size mums used on the Northwood Advertising pieces? Since “Iridescence IS the Essence” of our selections, perhaps there was some lack of it, reflecting the $800 price for last years' sale. The numbers of bidders with determination has a huge bearing on results, as well. Ours was another successful purchase from an ad in the old Antique Trader, now out of print. In July of 1987, we were both still working full time, and unable to travel from San Diego back to the mid-west as often as we might have liked, to attend auctions, although we did our best to “keep the desert path well-traveled by” in those days! 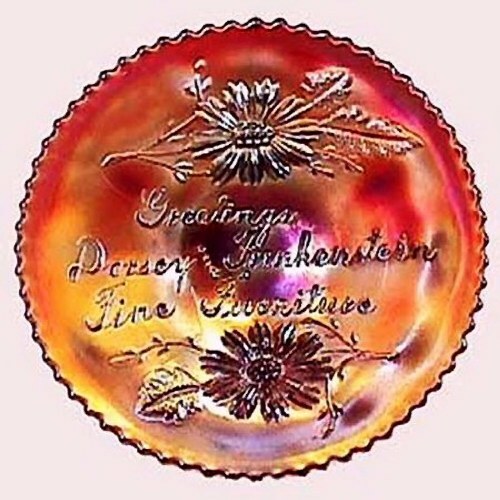 Since 1989 when John Resnik asked for HELP in locating the Dorsey and Funkenstein place of business, there apparently has been no information presented. We can tell you that Fenton was the manufacturer. The piece has their Wide Panel exterior. Although ruffled and ice cream shape bowls are known, along with handgrip plates and flat plates, we are quick to tell you that for the years 2000 through 2002, examples of none in this pattern were sold at auctions of record. An IC shaped bowl was listed over Ebay in early Feb. 2004. Whether or not an actual “sale” took place, we are not prepared to say. The auction was terminated early. 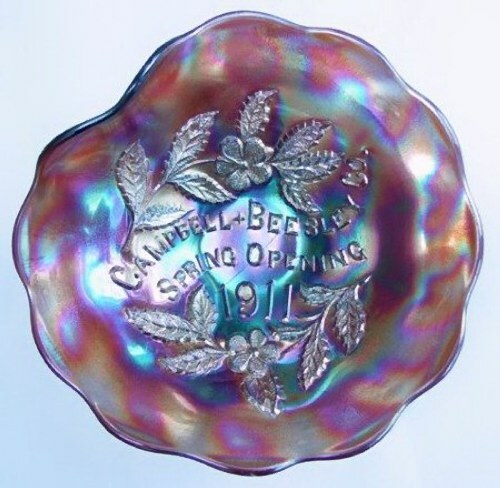 We sold our very nice ruffled bowl to Eleanor Hamilton in the late `80's or very early `90's, thinking we would be able to locate a flat plate to go with our growing collection of Advertising plates. At this writing, we continue without one. 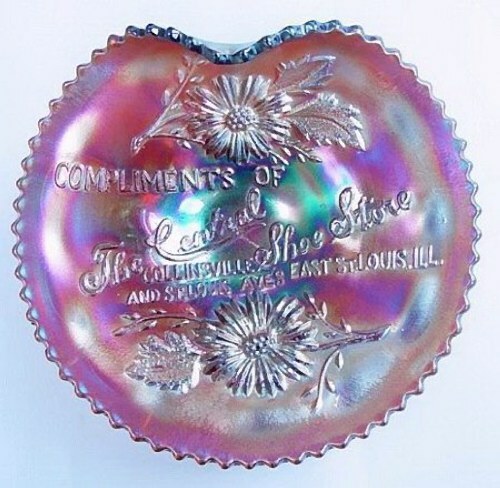 These Advertising pieces have various applications of iridescence, some being quite goldish or bronze in appearance. We strive for a blend of color, so when the flat plate example appeared in the Nov. 22, 2003 auction of the Adams' collection, we passed on it. It had quite a gold look about it. At $2600, it really didn't need any help from us anyway. (smile) A previous sale (recorded) of this pattern was in 1997, when a handgrip style brought $2200. Should any of you have a multi-colored handgrip or flat plate to sell in this pattern, we would most appreciate hearing from you.